…. Is a series of interconnecting Garden Rooms …. The whole garden has been designed as a series of linked garden rooms. Each garden room has a different function but has creates a real sense of belonging. 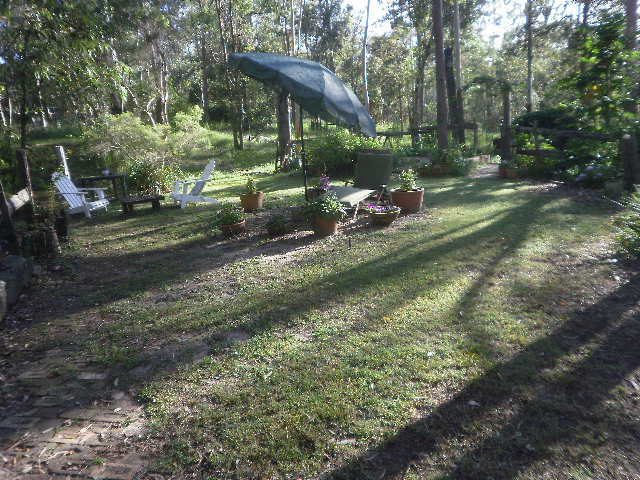 It may not beopen space but it has sense of unity different to the next garden room ……. 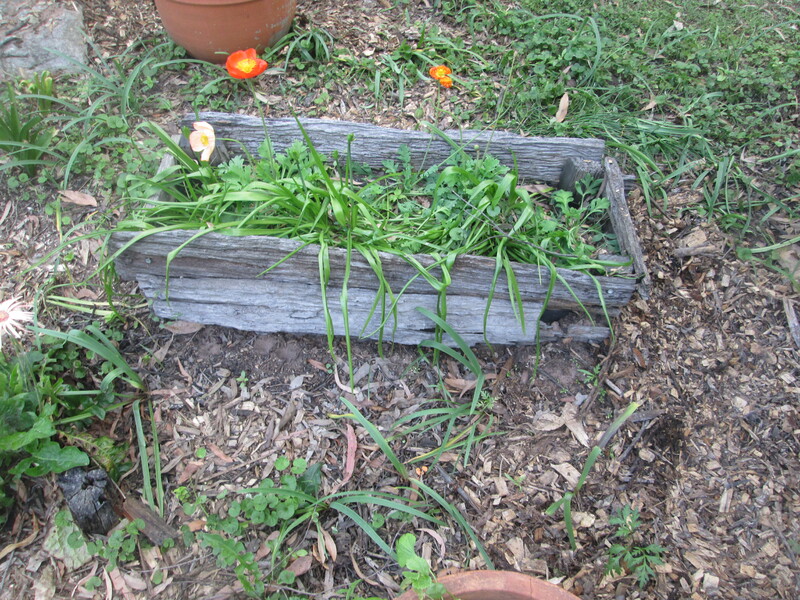 poppies were planted in this compost. See the results below ……..
…. 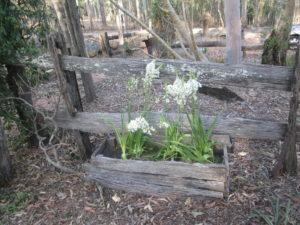 In the first year in 2013, Eucharist lilies were planted out to give large masses of white flowers …. 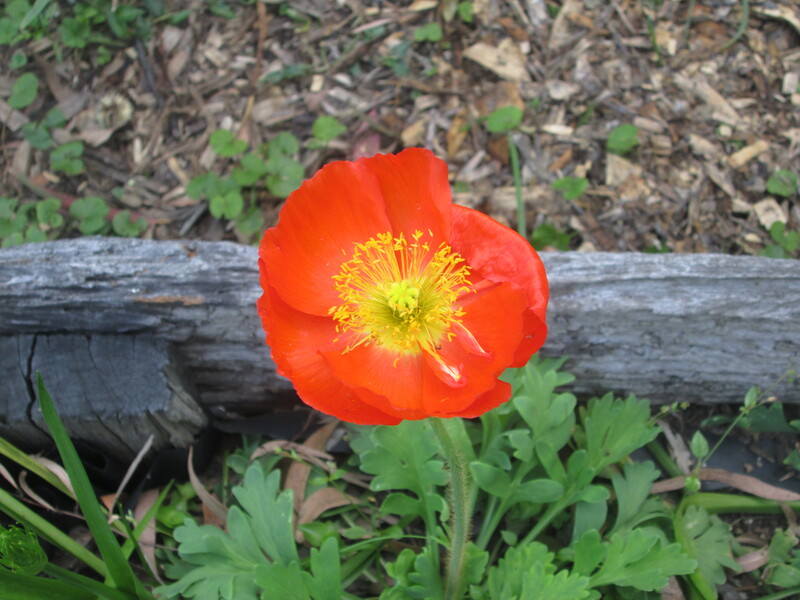 In the second year = 2014, seedlings like poppies were planted in this compost. ……. 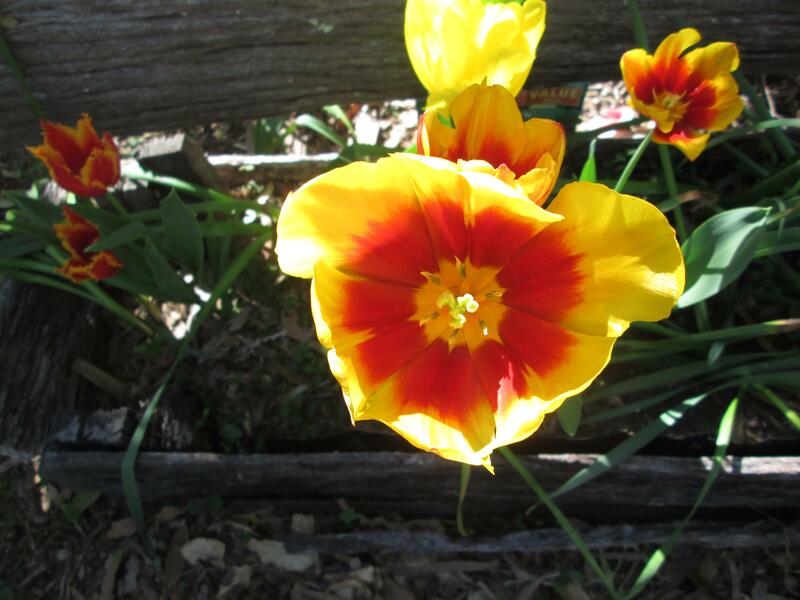 In 2015, tulips grew and flowered. 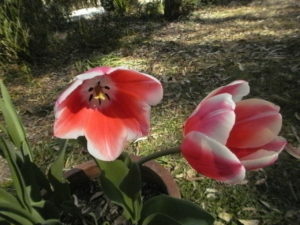 In Subtropical Queensland, you do not grow tulips as it is too warm. They like colder climates as down in Southern Australia or overseas. What we do is to trick the tulip bulbs in getting them to think they have gone through winter overseas. We put them in the fridge crisper in April / May, then we take them out and plant them in late May. They grow and flowering late August. Below is the result ! ……. ……. Tulips planted in a separate pots ……. …. 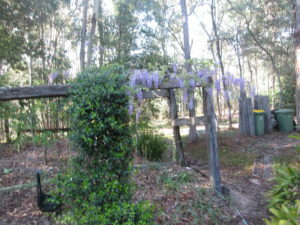 Wisteria in flower in September 2015 …. …. 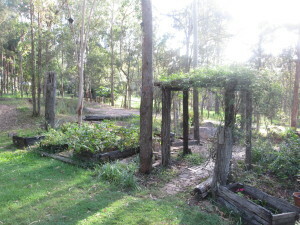 growing over an old cubby house framework I built for our two children in 1984. They are now 35 and 37 years of age. Wisterias climb by twining their stems either clockwise or counterclockwise around any available support. They can climb as high as 20 m (66 ft.) above the ground and spread out 10 m (33 ft.) laterally. The world’s largest known wisteria is in Sierra Madre, California, measuring more than 1 acre (0.40 ha) in size and weighing 250 tons. Planted in 1894, it is of the ‘Chinese lavender’ variety. The leaves are alternate, 15 to 35 cm long, pinnate, with 9 to 19 leaflets. 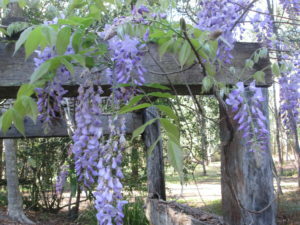 The flowers are produced in pendulous racemes 10 to 80 cm long, similar to those of the genus Laburnum, but are purple, violet, pink or white. There is no yellow on the leaves. 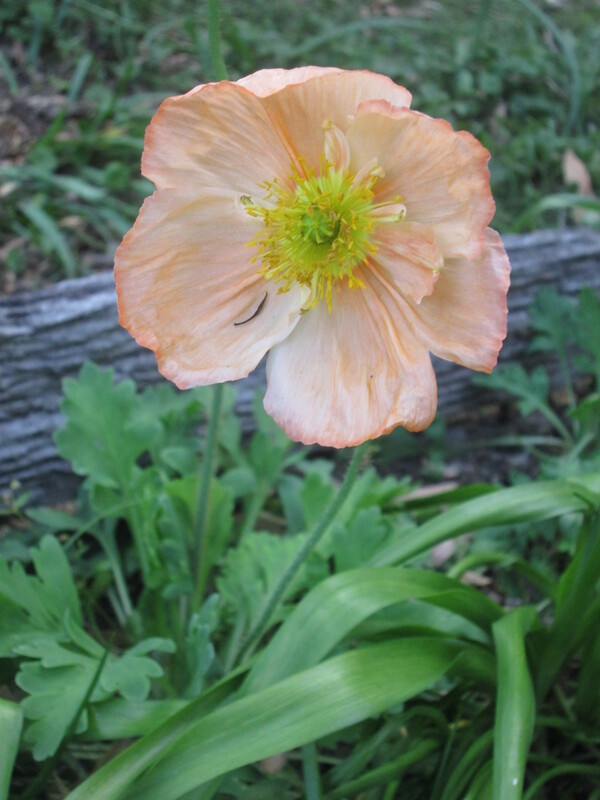 Flowering is in spring (just before or as the leaves open) in some Asian species, and in mid to late summer in the American species and W. japonica. The flowers of some species are fragrant, most notably W. sinensis. 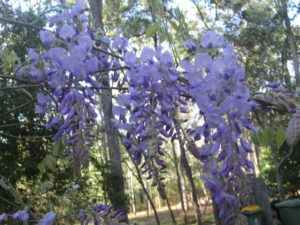 Wisteria species are used as food plants by the larvae of some Lepidoptera species including brown-tail. The seeds are produced in pods similar to those of Laburnum, and, like the seeds of that genus, are poisonous. All parts of the plant contain a saponin called wisterin, which is toxic if ingested, and may cause dizziness, confusion, speech problems, nausea, vomiting, stomach pains, diarrhea and collapse. There is debate over whether the concentration outside of the seeds is sufficient to cause poisoning. Wisteria seeds have caused poisoning in children and pets of many countries, producing mild to severe gastroenteritis and other effects. … In November 2017 ….. 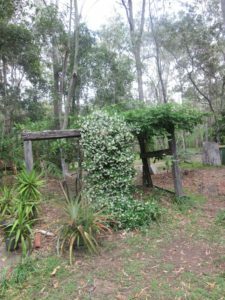 The profuse mass of small white flowers in the photograph below is a jasmine plant twisting and climbing up a post old cubby house framework I built for our two children in 1984. The basic chromosome number of the genus is 13, and most species are diploid (2n=26). However, natural polyploidy exists, particularly in Jasminum sambac (2n=39), Jasminum flexile (2n=52), Jasminum mesnyi (2n=39), and Jasminum angustifolium (2n=52). Jasmines are native to tropical and subtropical regions of Eurasia, Australasia and Oceania, although only one of the 200 species is native to Europe. Their center of diversity is in South Asia and Southeast Asia. A number of jasmine species have become naturalized in Mediterranean Europe. For example, the so-called Spanish jasmine (Jasminum grandiflorum) was originally from Iran and western South Asia, and is now naturalized in the Iberian peninsula. Jasminum fluminense (which is sometimes known by the inaccurate name “Brazilian Jasmine”) and Jasminum dichotomum (Gold Coast Jasmine) are invasive species in Hawaii and Florida. 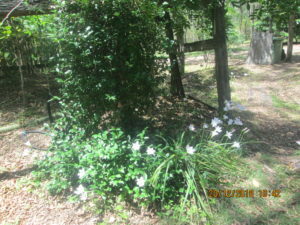 Jasminum polyanthum, also known as White Jasmine, is an invasive weed in Australia.